Leathbridge has a thriving marriage industry, mainly for the scenic locale that affords an expansive view of the valley. With lush backgrounds, unusually temperate climates and competitive prices, it’s no surprise that parts of the Morehouse State Park are booked for wedding parties months in advanced. This isn’t so much an advertisement for the services. Heaven knows that the local Tourism Board pumps enough into drawing in as much as possible with its savvy ad campaigns. This is more of an explanation that, come May through September, we often see many brides being transported around town as if maids-a-marrying were valued dry goods and we had somehow been taken back in the trading post days of Cole Leathbridge. Most of the weddings are traditional, which isn’t to say they are strictly man-woman pairing. Quite the contrary, as all types of human-on-human, consensual matrimonies are welcomed so long as the money is legal tender. No, the traditional aspect is in the garments worn by those participating. A lot of white gowns are seen and sold throughout town, with a bevy of men suited up in fine rented tuxedos. There are a few creative types, though, eschewing convention for more flamboyant or discreet wedding day wear. Couldn’t have been more than two weeks ago that we caught sight of a woman striding to the towncar, an electric pink veil with matching train blowing in the wind. She looked so happy. There are options for some of you horror fans when, despite what perceptions others might have about you, you decide to marry. First off, don’t get married on Halloween. That’s free advice. It seems appealing, it seems like it’s appropriate to do but it’s more than just cliché. It s ‘gauche,’ a term we’ve picked up from Poinsettia since she and her father were around here recently. ‘Gauche’ is gaudy, tasteless and somewhat repulsive when it comes to behavior. Unless your relationship has a significant, undeniable attachment to October 31st, do not get married on that day. The idea is that you’re cementing a date on the calendar as your own, as audacious as that sounds. Leave Halloween alone and get your own day. Second, don’t go all black in your outfit choices. You can do magic with white and a little accessories. In fact, Zombie Bride has done just that. 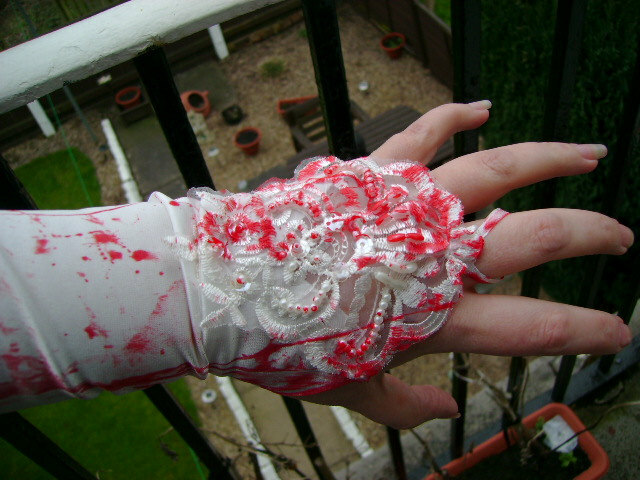 As focus of this week’s Tuesday uEtsy, Zombie Bride showcases that you can be just as horrifying as you can be romantic with white wedding finery. Ladies, Bluebeard was a man who killed his wives. It might be time to change up the myth. Don’t be a black widow. Be a white widow. And when you do that, NO FINGERPRINTS. So get these gloves if you plan on having a short honeymoon and an even shorter marriage. Divorce is cheap. Just make sure they can’t trace you to the body. Also, do it so it looks like an accident so you can keep your registry gifts. 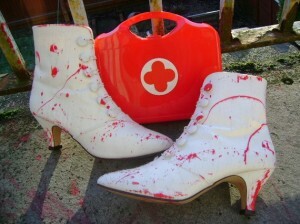 Not all clothing sold by Zombie Bride has to be reserved for your special night. This blood splattered bra is actually, in our minds, a very amusing joke. Some young, attractive mate (male or female) has finally convinced you to let them take your shirt off. It’s an exciting moment, never to really be reproduced throughout the whole of the relationship. After either excitingly undoing the buttons, pulling at the zipper or sliding the shirt up your side, they reveal an undergarment that looks like it’s been through a slaughterhouse. Instant libido killer? Or libido ENHANCER? Either way, interesting results will vary. Let us know. What makes this sweat jumper so fantastic is that you can wear it all year round. It’ll help keep you warm in the cold months but if you want to bust it out during summer? It has ventilation. 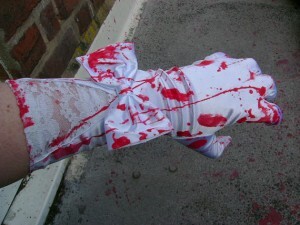 Unlike the zombies you might be fighting, this piece of clothing breathes well. Of course, the dress-wearing individual of the wedding shouldn’t be the only one covered in blood. 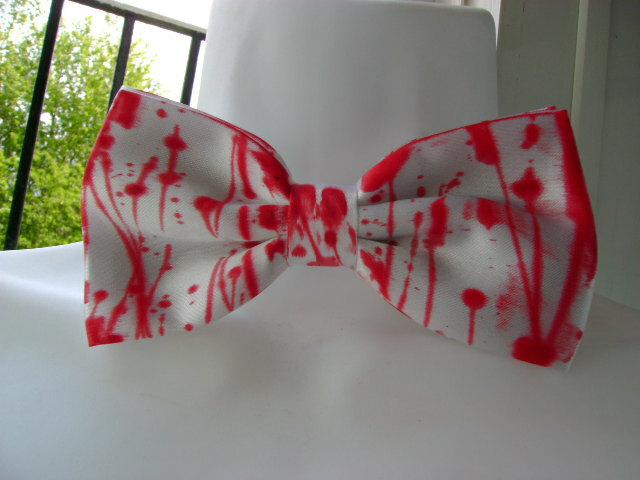 No, for you groom or bow-tie wearing individuals, Zombie Bride has you covered. In blood. From your head to your toe, your special day can be complete. You can have a fantastic, all encompassing look on the day you tie the knot or have a special set for when you step out onto the town for a night of partying and decapitation. Find the shop here and see what you can get for your day. After you get back from the honeymoon, check with us here at Tuesday uEtsy.